This arctic-alpine species occurs in rock crevices and on small ledges on generally north-facing and shady cliffs in Cook and Lake counties. When Saxifraga paniculata (encrusted saxifrage) was designated a threatened species in 1984, only a handful of populations had been documented from a small area in northern Cook County (Border Lakes Subsection). Since that time, approximately 15 additional populations have been discovered in a broader area, including the North Shore of Lake Superior (North Shore Highlands Subsection). The species is now known to be more widely distributed than previously thought, and threatened status is no longer appropriate. However, in recognition of the relative rarity of the species and its restricted range in Minnesota, it was given the less protective status of special concern in 2013. Saxifraga paniculata is a perennial herb that is most easily and reliably identified by its distinctive basal rosette of leaves. Leaves are 2-3 cm (0.8-1.2 in.) long and stiff, with margins finely and densely toothed. At the base of each tooth is a white lime-encrusted pore, hence the common name of the plant. Rosettes of S. paniculata grow at the ends of long horizontal stolons (runners). The flowering stem may rise 10-30 cm (4-12 in.) in height and displays most of the small white flowers near the top. Each flower has 5 white petals, 1 inferior ovary, 2 styles, and a 2-beaked capsule (Brouillet and Elvander 2009). In Minnesota, S. paniculata typically occurs in rock crevices and on small ledges on shady inland cliffs and sheltered Lake Superior shoreline cliffs that generally face northward. The crevices in which the plants are rooted may be fairly dry. In some places, the plants are in thin and gravelly soil on uppermost ledges, sometimes in full sun for a portion of the day. However, most plants are in more mesic portions of a particular cliff. The general bedrock types may be diabase, gabbro/diorite, basalt, or Rove Formation rocks (shale, argillite, greywacke). Associated plant species include Aquilegia canadensis (columbine), Campanula rotundifolia (harebell), Carex eburnea (ivory sedge), and Woodsia glabella (smooth woodsia). Saxifraga paniculata is an herbaceous perennial plant that forms basal rosettes and an erect flower stalk. Leaves are stiff but not evergreen. New shoots are produced in late summer, next to the previous year's rosettes, and they turn green quite early. Plants begin to produce new stolons and rosettes in the spring. Stolons allow this plant to spread vegetatively. Flowers are perfect, having both male and female parts. Plants begin flowering in June, and fruits usually begin maturing in late July or early August. The cliff habitat of S. paniculata can become hot and dry during the summer months, leading to moisture stress in most plants. As an adaptation to these conditions, the leaves of S. paniculata can fold over the center of the rosette, reducing the evaporative leaf surface area by 80%. When moisture conditions become more favorable, the younger leaves return to their original position. The older leaves may remain in a closed position, to shade the rest of the plant, which can keep the center of the rosette up to 10 degrees C (18 degrees F) cooler (Neuner et al. 1999). Like the other rare arctic-alpine plants in Cook and Lake counties, S. paniculata has a very limited amount of suitable habitat in which it can survive. Only about half of Minnesota's North Shore populations happen to be on public land in federal or state ownership; many important populations are on privately owned land. Recreational rock climbing is one of the few human activities that directly threaten this species (Wezel 2007). Indirect impacts could come from changing habitat conditions due to global climate change. The best time to search for S. paniculata is when it flowers, from early June to July, and when it fruits, from late July through August. Rosettes can be seen anytime during the growing season and even through the winter, though they lose most of their green color. A fairly thorough inventory by the DNR Minnesota Biological Survey has been completed for rare plants along Minnesota's North Shore of Lake Superior and throughout the Border Lakes Ecological Subsection, which includes the Boundary Waters Canoe Area Wilderness. It is possible that additional locations of S. paniculata may be found in the Border Lakes Subsection before the survey is complete. The potential discovery of new populations does not alter the need for conservation of this species due to the exceedingly limited amount of suitable habitat. Brouillet, L., and P. E. Elvander. 2009. 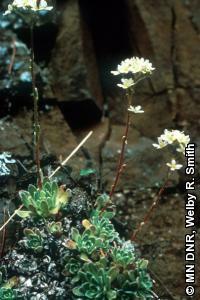 Saxifraga. Pages 132-146 in Flora of North America Editorial Committee, editors. Flora of North America north of Mexico. Volume 8. Oxford University Press, New York, New York. Butters, F. K. 1944. The American varieties of Saxifraga aizoon. Rhodora 46:61-69. Butters, F. K., and E. C. Abbe. 1953. A floristic study of Cook County, northeastern Minnesota. Rhodora 55:21-201. Neuner, G., V. Braun, O. Buchner, and D. Taschler. 1999. Leaf rosette closure in the alpine rock species Saxifraga paniculata Mill. : significance for survival of drought and heat under high irradiation. Plant, Cell and Environment 22(12):1539-1548. Penskar, M. R. 2008. Special plant abstract for Saxifraga paniculata (encrusted saxifrage). Michigan Natural Features Inventory, Lansing, Michigan. 3pp. Voss, E. G. 1985. Michigan Flora. Part II: Dicots (Saururaceae-Cornaceae). Cranbrook Institute of Science Bulletin 59 and the University of Michigan Herbarium. University of Michigan, Ann Arbor, Michigan. 727 pp. Wezel, A. 2007. Changes between 1927 and 2004 and effect of rock climbing on occurrence of Saxifraga paniculata and Draba aizoides, two glacial relicts on limestone cliffs of the Swabian Jura, southern Germany. Journal for Nature Conservation 15(2):84-93.